UPDATED February 1st, 2019- 1 of 2 murals already awarded! As well as discouraging unwanted graffiti on its property Carrot Common wishes to partner with the City of Toronto and local artists to create a platform for reflection and community dialogue around the importance and value of pollinators within our urban landscape. 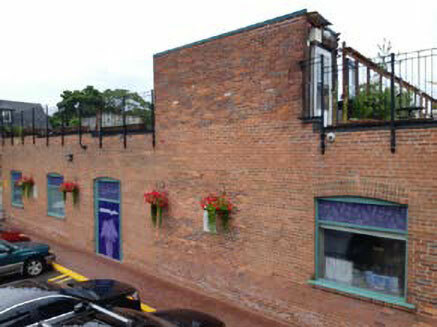 This initiative complements the existing businesses and the Carrot Green Roof, “a gardening and community resource centre located on the roof of the Carrot Common mall in the heart of Toronto where schoolchildren, neighbours, clients and the general public are able to view a wide diversity of vegetation and demonstrations within the intensive and extensive gardens and vertical garden spaces” and where pollinators are essential partners. Pollination is the golden thread of life that weaves through an intricate planet of diversity to allow life to survive and thrive. A thread that connects all. Bees, butterflies and moths are the most familiar pollinators. Flies, beetles, ants, wasps, hummingbirds, and in some regions, bats, are important pollinators as well. Animals and people also act as pollinators when they carry pollen from one plant to another. Pollinators are essential in the ecological integration of healing our planet, ourselves and the diversity of life that participates in this cycle. Pollinators participate in this cycle of life healing the earth while the earth heals us. Carrot Common is a diverse place of health and healing inherent in the therapists, the Big Carrot and a Healing Garden filled with pollinator plants that heal people and planet. At the same time urban people by helping pollinators survive show respect for the earth and for diversity. The result are pollinators and plants healing the earth and those who inhabit it. The 18 foot x10 foot mural to be done on medium density overlay board will symbolically express the lush diversities of plants, birds, insects, animals and people, faces Jackman Street at 348 Danforth Avenue, the home of Carrot Common. Outside wall, waiting for a beautiful mural. Bees, butterflies and moths are the most familiar pollinators and less so are flies, beetles, ants, wasps, hummingbirds, animals and people (different cultures and ages). Importantly there are many different species of bees (like the honey bee, green metallic bee, mining bee, a bumble bee, the rusty patch bee)and having different types on a single flower will promote our love of diversity. Other suggestions for artists can be provided. 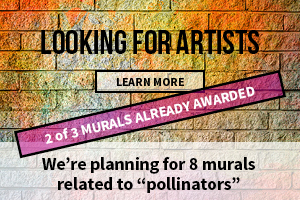 It is hoped that the concept idea described in this document will help interested artist(s)to do a concept sketch for the mural art work showing and featuring pollinators and the key role they play in all plant life, in maintaining healthy eco-systems and how important they are for our food supply and how trees, shrubs and many beautiful flowers rely on them. The invitation is to an artist or a team of artists to provide a conceptual sketch of the proposed artwork. While the City of Toronto is expected to provide the art materials from their StreetArt program the artist(s) will be contracted and paid by Carrot Common. There is a $2,000 compensation to the artist(s), while materials and related expenses to fastening the artwork to the brick wall will be covered by the City and Carrot Common. A jury of four people will evaluate the submissions and notify the artist(s)that have been selected. Deadline for submissions is Wednesday, May 1st, at 6 pm. The work must be completed by July 31st, 2019. Learn 'How It Works' -- Take all 12 steps in 4 hours! Seating is limited. Please call to confirm your attendance: 416-533-6024.